Faith is a 62 metre luxury superyacht owned by fashion magnate Lawrence Stroll. Previously known as Cakewalk, the yacht was originally built for Charles Gallagher of Gallagher Industries. Gallagher sold her to Frank Fertitta who renamed her to Fortunato. She was then named Faith when she was sold to Lawrence Stroll. 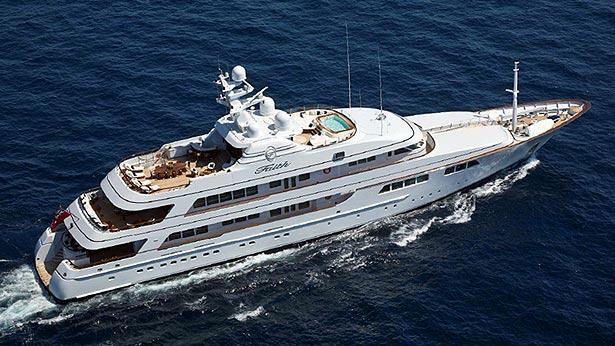 Faith was constructed by the Dutch ship building company Feadship and launched in 2000. The exterior design and naval architecture was taken care of by De Voogt Naval Architecture and in later years the interior was renewed by Andrew Winch Design Studio. The Faith features a sleek and classic look typical of Feadship vessels. The yacht has a raised bow, a slanted wheelhouse, long sheer lines and straight windows. With space for 14 guests in seven spacious staterooms, the Faith provides sophisticated décor, and comfortable furnishings. Exquisite fabrics and unusual materials create an interesting textural experience throughout every area. The Faith has an excellent range of amenities that include air conditioning, a Jacuzzi on deck, a WiFi connection and a well-equipped gym. When the Faith was refit in 2005 the helideck was removed in favour of creating a more social gathering oriented space. The al-fresco dining and lounging areas are ideal spaces in which friends and family can get together to make memories. Propelled by twin screw propellers and powered by two diesel engines, the yacht can easily achieve a speed of 16 knots. Around 36,000 litres of fresh water can be stored on-board and the Faith has a range of 5,800 nautical miles when travelling at a speed of 13 knots. The ultra-modern stabilisation system reduces the roll motion effect and ensures that guests can enjoy a smooth and enjoyable cruising experience. Lawrence Stroll is a successful entrepreneur in the fashion industry. He is perhaps best known for his success with the internationally acclaimed fashion brand Tommy Hilfiger. Stroll launched his career by selling Polo Ralph Lauren and Pierre Cardin in Canada. He started working with Silas Chou of Hong Kong and co-founded a company called Sportswear Holdings Ltd. Through Sportswear Holdings Stroll acquired the Tommy Hilfiger brand in 1989. At this point the brand was relatively unknown, but Stroll soon built it into an internationally renowned brand with over US$2 billion in sales. In 1992 Tommy Hilfiger went public, and in 2006 the brand was sold to Apax Partners for US$1.6 billion. Sportswear Holdings and Lawrence Stroll also acquired a substantial stake in Michael Kors Holdings in 2003 for US$85 million. When the company went public in 2011 the share had increased in value to US$1.9 billion. Yachts are not the only luxury vessels that Stroll is interested in. He is an avid Ferrari collector and owns at least 25 vintage Ferraris. In 2013 he paid a staggering US$27.5 million for a rare 1967 Ferrari Spider and in 2014 it was rumoured that he was going to buy the Sauber Formula 1 team. As in July 2016 Lawrence Stroll’s estimated worth was US$2.4 billion.